Finding out you’re going to have not one, but multiple babies can be exciting, yet extremely scary. As any parent knows, packing a diaper bag is a lot harder than it sounds – and that’s just for one baby! So, how do you go about packing a diaper bag for multiple babies and is there even a bag big enough to fit everything in that you’re going to need? The good news is, there are bags big enough to cater to multiple child families. Here, you’ll discover some of the top diaper bag essentials for parents with multiple babies. 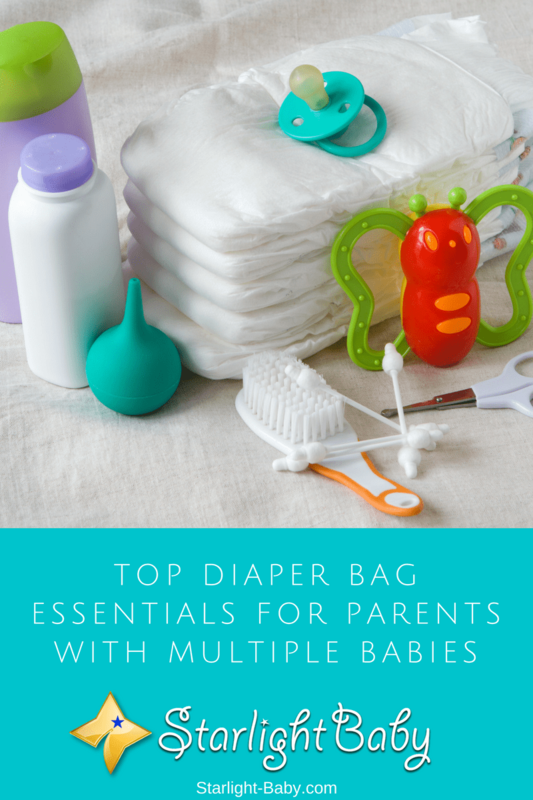 Ok, so diapers are a pretty obvious diaper bag essential, but how many will you need? Well, for a single baby, it’s always recommended to take at least two spare diapers with you. Obviously, it depends upon how long you envisage being out of the house, but generally, two spare diapers per baby are recommended. So, if you have twins, take at least four additional diapers with you and so on. The second is a little more unusual but exceptionally handy! Pet waste bags can be a godsend when it comes to particularly stinky diapers. When you’re out with your little ones, there isn’t always a wastebasket to throw the diapers in after you’ve changed baby. This means you’re sometimes going to need to carry the dirty diaper around with you. Pet waste bags are strong, often scented bags, which can help to minimize the smell and provide a hygienic storage option until you can find a suitable wastebasket. If you’re reluctant to spend money on pet waste bags, there are a few cheaper alternatives. Empty bread bags are a good example as they are easy to tie and you’ll be able to fit at least two dirty diapers in there. Another essential item that should be in every diaper bag is baby wipes. These can do numerous jobs, so they can actually limit the number of other essentials you’ll need. For example, they’re great for diaper changes, wiping runny noses and cleaning up vomit, wiping down surfaces and even cleaning the car. The amount of baby wipes you’ll get through is surprising so always make sure you’ve got a spare pack in your diaper bag. Sanitizing spray is another essential you won’t want to forget. It can be used to clean surfaces after a diaper change, as well as to clean your hands. Extra clothing should always be taken with you, regardless of how little time you plan to be out. Never underestimate your baby’s ability to ruin an outfit within just five minutes! As you’ve got multiple babies to worry about, it’s a good idea to pack at least one spare change of clothes for each baby. You might want to pack additional clothing for yourself too. Even just a spare top can come in extremely useful in the event one, or more of your babies, spit up onto you. Shop For Baby Clothing Over At Our Store! Breastfeeding in public can be difficult enough with one baby, but it can prove almost impossible if you have twins, triplets or quadruplets! So, feeding bottles can prove to be absolutely essential. However, it can get a little tricky with multiple babies as each will have their own preference over the type of bottles they prefer. This means you’re going to need to make sure you have the right feeding bottles to suit each baby. It’s also a good idea to label the bottles so you know which one should be used for each baby. Not all parents are a fan of pacifiers, but if you aren’t opposed to using them they can make your life so much easier when you’re out with your little ones. One pacifier for each baby and perhaps even a spare one just in case would be ideal. When you have multiple babies, you know that just one unhappy baby can set off a loud, chain of unhappy babies! So, to save your sanity, a pacifier can stop a potentially chaotic multiple baby meltdown before it’s even begun. You need all of the help you can get when it comes to raising multiple babies, so don’t be afraid to take advantage of a pacifier if you need to. Swaddling blankets may not be something you’ve really thought about taking with you, but they can prove invaluable. Not only can they help to comfort your babies, but they can also be used for multiple purposes. You can double them up as a stroller shade and they can also be used a nursing cover for example. There’s a lot of different swaddling blankets on the market so it’s a good idea to do your research prior to choosing one for your babies. Once you’ve found one you like, you’ll want to invest in one for each baby. This one’s for you. Being hungry is no joke, yet it’s a real possibility when you’re the parent of multiple babies! It can be difficult finding the time to enjoy a nice, filling breakfast. So, if you’re venturing out and you’re running low on energy, healthy snacks are essential. Think energy-rich snacks such as nuts and fruit. While sugary snacks may give you a quick spike of energy, the rush won’t last for long and you’ll end up feeling worse than you did before snacking. The above are just some of the main essentials you’ll need. As you can see, you’re going to need a pretty large bag to fit everything into. There are some excellent large diaper bags on the market which are specifically designed for families with multiple babies. So, it’s definitely worthwhile investing in the larger bags! Is there anything we’ve missed out you feel should be included in a diaper bag for multiple babies? Let us know below! From experience, I would distinctly tell you that one baby is a huge work and not to talk more of having to care for two or more at the same time. As much as it’s lovely to have twins, triplet, it’s very difficult and too stressful for the parent. An extra pair of hands is definitely needed to help out with taking care of the babies, a mother cannot do it all alone by herself to avoid breaking down with stress. And yes, taking care of one baby is difficult in itself so I can’t imagine how parents with twins, triplets, or more are able to manage. I salute them. Having two or more babies involves lots of work and time, there have to be coordinations all the time, some parents don’t understand that having seperate pet bags for diapers will do the work. If all their things are joined together you will get more frustrated and hectic at picking which is which, keeping their diaper pet bag is the first step to being coordinated with the kids affairs, you will be stress relieved. Yes, I totally agree. To each his own as they say. Separating each baby’s item will hugely help keep the stress level at bay. The truth is that taking care of the baby have never been an easy experience for any nursing mother no matter how we all try to put it. However, I would say that reading most of the articles you’ve written so far have given a sigh of relief to mothers and even fathers alike on the way to nurse the baby while still small. I will always say that understanding the items the baby needs while we are going out is necessary to make each outing a good one. Thank you for the honest feedback, Henrywrites. It keeps us on our toes to give the most crucial information needed by parents. No matter how many books we read to prepare for child-rearing, it doesn’t seem enough when we’re already facing the situation. It is truly never easy that is why continuously reading tips/articles on parenting is a must for us to keep our sanity, haha. I agree with you that it is basic to read tips such as the ones provided on this blog for the parents to enjoy the days of nursing the baby. One thing that I’ve come to realize is that no amount of knowledge is enough for nursing mothers for there are still lots needed to know and it is by reading articles like these can that be possible. You’re right on using the instinct. I mean it is thinking at a point on the best way to follow and what to do on certain situations that matters so much. I have seen a situation where moms that don’t have access to the internet know so much about parenting. Our baby is around 8 months old. Sometimes my wife and I talk about planning another baby and sometimes we conclude that we are not going to have another child. One of our main concern for having two children is whether we can give time to our babies or not. We are working parents and when one baby is already giving us hard time, how could we manage another. The tips you have mentioned here also help to the parents with one baby. We always carry these essential items. After you experience raising a baby, most working parents often no longer want another because they’re unsure if they would still be able to take care of another child. You may want to plan on it. Experts normally recommend a three-year gap between kids; others have it longer, way longer, like 10 years or more.